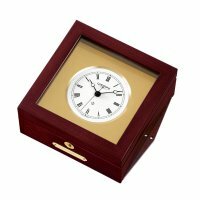 The WEMPE Ship's bell clock PRO is a very attractive timekeeper in a massively crafted mahogany casing. The dial has a diametre of 80 mm and is white in colour. The ship's bell clock PRO is delivered with a battery-operated quartz movement. The wooden casing is equipped with a protruding casing base, so the instrument can be mounted practically anywhere. The WEMPE ship's bell clock PRO is a desk clock and, at the same time, a very decorative timekeeper on the wall of a ship. The WEMPE Ship's bell clock PRO comes with a certificate of accuracy.